When a dutiful Los Angeles police officer named Roger Mortis (Treat Williams) tries to apprehend robbers that happen to be zombies, he ends up as one of the undead himself. Since Mortis has managed to stay in his right mind, he aids his loudmouthed partner, Doug Bigelow (Joe Piscopo), in getting to the bottom of the macabre crime ring. Eventually the cops track down the villains, including Arthur P. Loudermilk (Vincent Price), and try to end their supernatural thievery. An entertaining, reasonably gory '80s horror comedy that manages to be both ridiculous and exciting. Similar to Fright Night, but on a slightly lower budget, and with a more off-beat sense of humour, this should please most horror fans. Watch out for the abattoir scene, where the slaughtered meat comes back to life and attacks the main characters - twistedly funny! There's cameos by Darren McGavin (Kolchak) and Vincent Price too, just to give you some extra value for your money. 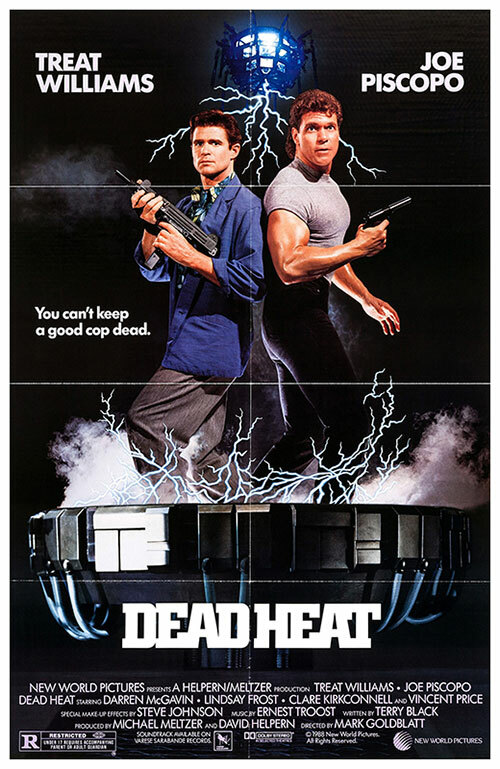 0 Response to "Dead Heat (1988) Mark Goldblatt"